This is your must have tool for smooth looking and stimulated skin, perfect for reducing the appearance of cellulite. Our natural boar bristle brush with massage nodules is super simple to use and it really works. As we get a little older, our skin becomes less efficient at this whole detox/elimination process and less effective at naturally shedding the layers of dead skin cells that clog up the surface. 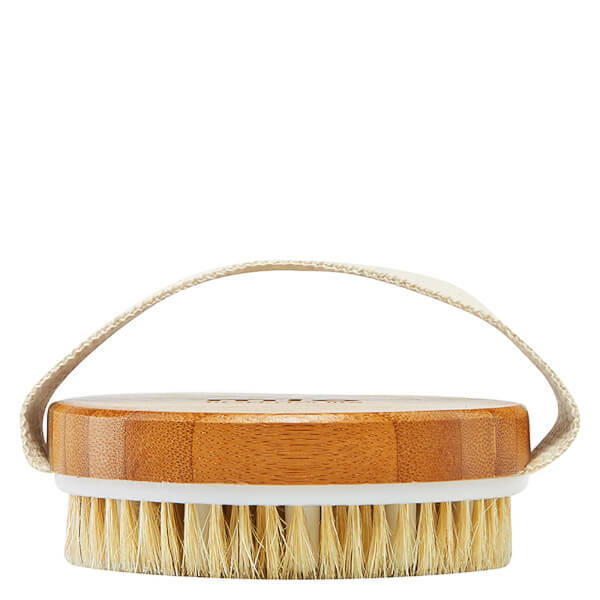 Body brushing is a fast and very effective way of helping keep your skin in peak condition. We are committed to ensuring all of our products are cruelty free. This product however is not vegan as it contains boar bristles. Mio Skincare is working to ensure all of our products are vegan in the future. Work up your calves, Always brush in the direction of your heart (so upwards on legs). Remember the backs of your knees when brushing your thighs! Then brush your back, as much as you can reach (or ask your partner to help!). Finally brush your tummy and chest – using clockwise sweeps on tummy, following the direction of your digestive system. Adjust the pressure of the brush to the different parts of your body so it is comfortable. It should be stimulating enough to increase circulation but gentle on your skin. You should see a rosy flush to the areas you have brushed. It’s good to try and give a minimum of 3 minutes for this whole body brushing, ideally 3 times a week. Most massage therapists recommend brushing on dry skin, pre-shower. We have been brushing for years on both dry AND wet skin. Sometimes wet skin is easier and less scratchy and you can do it immediately after a bath/shower before towelling dry. It is up to you which one fits into your routine easier because we think both give huge benefits. Made of natural boar bristles (not nylon! ), rubber massage nodules, sustainable bamboo and a comfy cotton handle. I m not easily impressed but from the very first use of my newly acquired body brush; I was! 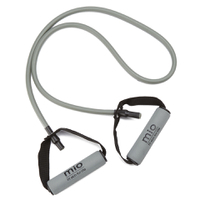 Ergonomically designed so that it’s comfortable to use and doesn’t slip and slide , it gave a first positive impression . Yes, it is a truly stimulating brush, so you don’t need to be over-zealous; but I bought it for an effect and I feel that, even over the short time I’ve used it, it has had just that. If you want tingling, smoother-looking skin; then I would certainly suggest you spend your pennies in this particular body brush! I've only used this once so far but instantly after dry brushing and then going in the shower after my skin felt circulated and so so smooth, I often have dry skin and my hairs grow back funny as I get them waxed but now my legs look already better! Can't wait to see the results improve in weeks to come!! I will definitely be getting my mum one to use too! I expected this to be a bit rough to do it's job but there must be a particularly rough piece as it's actually caused scratches and damaged my skin every time I've used it so far! I've inspected it and can't see where the issue is and I'm taking care whilst brushing but still it scratches me. After trying a few different body brushes (Elle MacPherson The Body and Bliss Spa), i definitely think this is the best one. Just the right amount of friction without being painful and the massage nodules feel like they're really getting the circulation going. The only downside is that it's a little hard to reach the top of your back but a good buy, especially for the price. The instructions in the pack are really good, it fits nicely in my hand and is easy to use. The bristles feel a little harsh at first but you soon get used to it, it definitely gets the blood flowing! its also a nice pick me up in the morning when I remember to use it! My skin looks so good after using this everyday in the morning before my shower. You can tell it really helps circulation and my skin tone is much more even (rather than blotchy !) and skin feels in much better condition. A great brush to keep skin smooth and exfoliated and the blood flowing!. Painful to start with and then I quickly became addicted to using it. I use it everyday now without fail, helps to keep my bumpy cellulite skin away. Let’s be honest, it’s not the most pleasurable experience you’ll have, as the bristles are harsh. However, it works. It really does. So I just try not to peel my skin off whenever I use it and that works for me! I bought this after seeing it in a magazine and now use it every day. Thanks to the handy booklet I have a full body routine. The massage bits hurt initially but it definitely wakes me up and within a week or so my skin feels smoother and my cellulite has definitely reduced. I always use a body brush as I noticed a huge difference in my skin from before I started using it, and this one is my favourite. the nodules really help massage and stimulate and my body is completely lump and bump free, down to body brushing and lots of water!! Not only is this brush super relaxing to use, it has made a huge difference to the appearance and feel of my skin. My skin is brighter and much softer. I like to use this just before a shower and I follow with my Future Proof body lotion. My skin has never looked and felt so great! I have never used a body brush before and was a little sceptical! However it is great, the brush is stiff so be ready for a good brush, but it is totally worth it - my skin felt instantly smoother!! Would definitely recommend and I will definitely be continuing to brush my skin! I have used several body brushes but this is my favorite. The bristles are not too soft or too firm. It glides easily over skin/body. Love this brush. Does what it says. Great value. Really does what it says on the tin! It wakes your skin up and I feel like I am detoxing - definitely going to the loo more often! My body feels more alive. So far so good. I've only used this product 3 times so havent seen a change but It makes my skin feel revitalised after brushing. The brush is made well by following the directions in the instructions makes it a quick routine to my morning. I immediately noticed the results after starting to use this brush! My skin feels smoother and softer and the process of brushing is also really therapeutic. Also love the little pouch it comes in. Would definitely recommend for those who need some good exfoliation and general uplift! 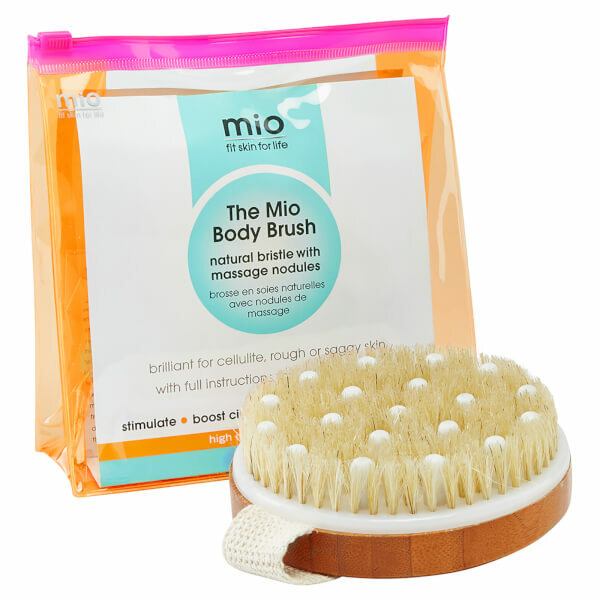 When I asked Mio for advice on how to tackle cellulite I was advised to use the Body Brush and Shrink To Fit, I am so pleased with the results. I never really understood body brushing but Mio told me how to get the best results and I am so pleased.